Knit, Lola, Knit: "Charm School"
I've been thinking about what I want to name my quilt, since calling it "my first quilt" is not only getting old, but frankly annoying. The line of fabric is called Charm, so I was thinking something with a play on that would be appropriate. 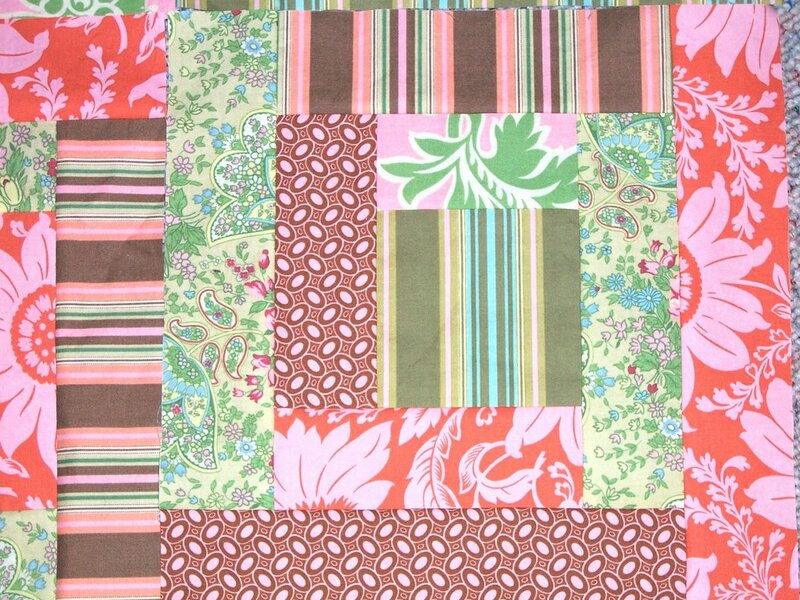 I think "Charm School" fits, since it's my first quilt (ok, enough already!) and I'm learning with it! Plus I think the colors and patterns of it remind me of a true girly-girl, who's trying to act all grown up. It's just laid out for now. 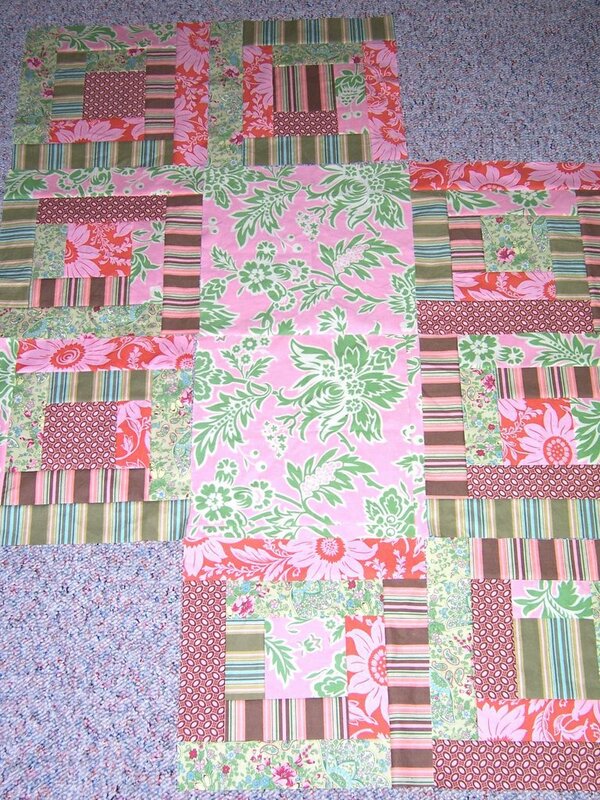 I have 1 1/2 blocks left and then it's just sew them together and add the borders. I'm trying to decide what fabric to use for the back. I think I'll go check out Jo-Ann's too (even though they don't carry Amy Butler), since $9/yard for backing material could get pricey pretty quickly. I also haven't decided on how I want to quilt it. Just in the ditch? Squares on the log cabins? Or follow the pattern on the back material? I'm a big fan of the "random" swirly look, but don't know if I could achieve this on my machine by hand. 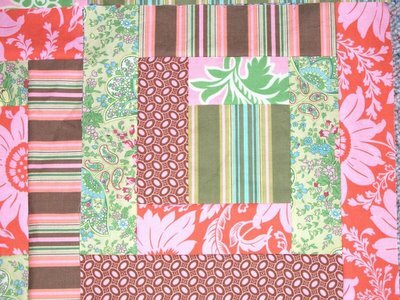 Squares might just be the best bet, since then I could use the little quilting guide that fits onto my walking foot too. Oh. My. God! I LOVE your quilt!! The fabric is, well, fabulous, and your random log cabins are wonderful. Can't wait to see the final result (and sorry to hear about your injury - we've all done it). i love it! looks so great. 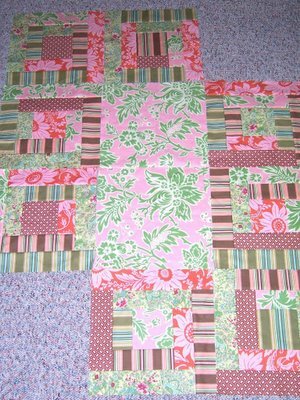 i've always thought of trying quilting, but i don't think i'm precise and patient enough. love the colors.